March is Women's History Month and as you consider ways to celebrate the role of women in the human sciences, why not start in your textbook? Structure & Function of the Body has several descriptions of the contributions of women who have made important contributions to understanding human structure and function. Elaborating on these stories yourself is one way to celebrate Women's History Month. Another is to assign students to find more information about one or more of these women. Perhaps they could present this information to their class in the form of a blog or wiki entry, a poster or handout, or other creative media. For example, the Growth & Development chapter includes a mention of Rita Levi-Montalcini's contributions to understanding the development of the nervous system. In the Reproduction chapter, we recognize the role of Virginia Johnson in early attempts to understand human sexuality. 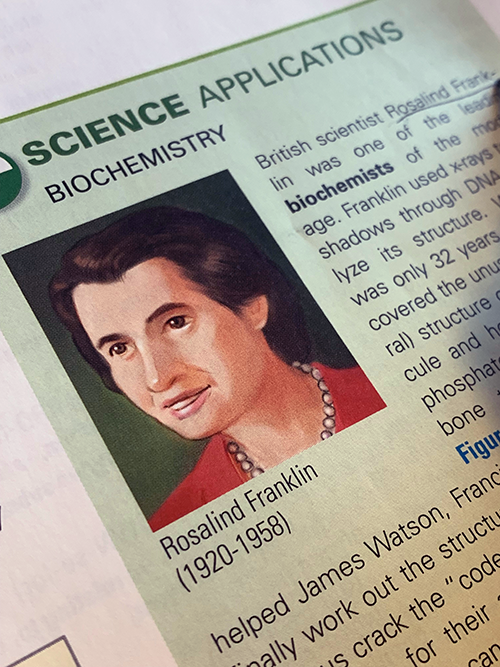 In the Chemistry chapter, we highlight the role of Rosalind Franklin in understanding the structure of DNA. Why not start a conversation in your course today about the role of women in understanding the structure and function of the human body? If you are thinking about ways to celebrate the roles of African-Americans in scientific discoveries related to human biology as part of African-American History Month (also known as Black History Month outside the U.S.), then you can start in your textbook. Structure & Function of the Body has several built-in resources to jump-start a conversation. 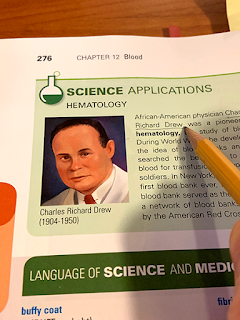 For example, the Blood chapter includes a boxed sidebar that highlights the contributions of Charles Richard Drew to hematology—particularly in the establishment of blood banks. In the Nutrition & Metabolism chapter, there's another boxed sidebar that mentions the role of George Washington Carver in the rise of food science. Just these two snippets can be a conversation starter in your course. Consider asking your students to contribute more—perhaps as a project or other assignment. You might also want to check out Black History Month: Celebrating Blacks in Science, Promoting Diversity in STEM to stimulate some ideas for your course. Can we assume that our students come to us already knowing how to read a book? Probably. Can we assume that they know how to effectively read and use an anatomy and physiology textbook? Probably not. Really? you may wonder. 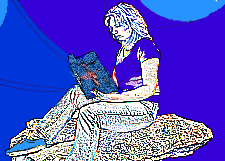 What's special about reading a textbook? 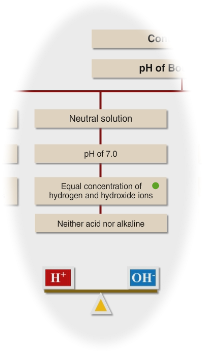 Technically detailed textbooks such as science textbooks are not much like books of popular literature. One cannot just sit down and read a chapter of an A&P textbook from start to finish—like you would with a novel—and expect to have learned much. And whatever you did comprehend would probably disappear from your brain by day's end. No, college reading experts tell us that students must use reading strategies to comprehend what they read in a textbook. But I see that my students come to me without any such strategies or skills. They've gotten by without them until they hit their A&P textbook, then wonder why the textbook doesn't seem to be helping them much. Then they limp along on class notes only—missing out on the deeper learning possible with the complementary material in the textbook. I was an excellent reader when I was an undergraduate. Looking back, however, I realize that I didn't use any special strategies—and I didn't really get a whole lot out of my hours of textbook reading. Not compared to what happens now when I do technical reading employing some of the proven strategies to increase my reading comprehension of technical scientific works. So what to do? Spend a week teaching our students how to read their textbooks? After getting some training ourselves in college reading strategies? I've provided a better option in Structure & Function of the Body. To guide students step by step through an effective reading strategy, I've embedded a series of hints that tell students exactly what to do to learn from their textbooks more effectively—and by spending less total study time. Some of these strategies I've discussed here in previous posts. For example, I've already walked you through the word-study approach to reading vocabulary. Take a look at any chapter in Structure & Function of the Body to see the embedded hints clearly marked with the Hint icon. If you don't have a copy, just go to this link and request a free review copy now! 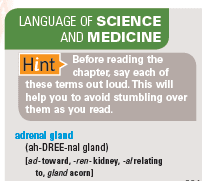 Then let's help our students by advising them follow the directions in the hints to get the most out of their A&P textbooks—and reduce their total study time! 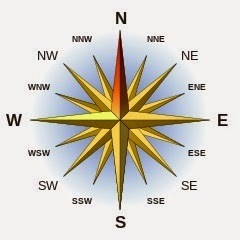 We are all familiar with compass rosettes used on maps. Those little flower-like icons surrounded with N, S, E, W at the corner of the map help us figure out how to orient ourselves in the places represented by the map. When using a map in which we cannot recognize any familiar landmarks, we almost subconsciously check the compass rosette, don't we? That's the first step in learning how to look at the new place we are about to explore. After a while, though, we don't need that rosette anymore. For example, when I look at a map of my hometown and see the familiar confluence of the Missouri and Mississippi Rivers, I can easily orient myself to the rest of the map. I don't even think of looking at the rosette. In Structure & Function of the Body, we use the same device for helping readers orient themselves anatomical diagrams and photos. Our anatomical rosette looks just like the compass rosette you'd see on a geographical map. 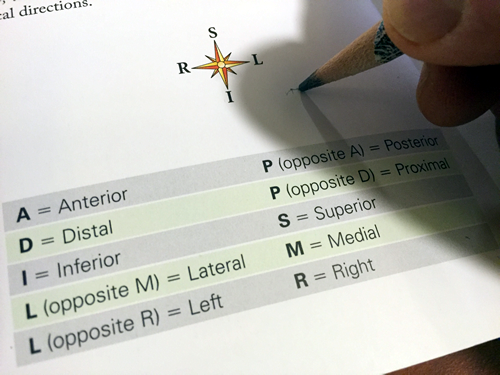 However, instead of N, S, E, and W, you'll find S (superior), I (inferior), A (anterior), P (posterior), and so on. When looking at these anatomical rosettes, a beginner can immediately figure out "which way is up" and go from there—instead of getting mired down in spatial confusion. Our readers also get repeated practice in using the directional terminology of anatomy—eventually allowing them to determine correct directions with barely a thought. All of our readers are beginners, so they need this kind of help to get a good start. 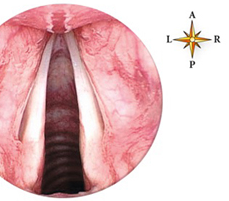 We instructors don't need that—we already know our way around these anatomical views. By having anatomical rosettes available in every anatomical illustration of Structure & Function of the Body, students have the training tools they need to gain the expertise that we instructors already have. By the time they've made it through to the end, our readers will not likely ever need these helps again. They know they "lay of the land" and can now find their way with their internal anatomical compass. I didn't start looking for compass rosettes in geographical maps until somebody showed them to me and explained how they work. Consider taking a moment at the beginning of your A&P course to point out the anatomical rosettes and show your students how they work. You may want to refer your students to the explanation in Chapter 1 of the text and to the handy reference chart on the inside front cover of the book. We all know that concept maps help students learn anatomy and physiology in at least two ways. One way is when we use concept maps to teach principles in a visual manner that clearly shows relationships among several ideas. Students thus clearly see how to organize their thoughts about connected ideas as they construct their own conceptual frameworks as they learn. Another way concept maps help students learn is when they build their own concept maps from what they already know about anatomy and physiology. Concept-map-making can thus be a powerful study tool. However, students without prior experience with concept maps often have a difficult time getting started. A few good examples of concept maps that relate to the ideas they are learning in your course are all they need to get a good start in making their own. 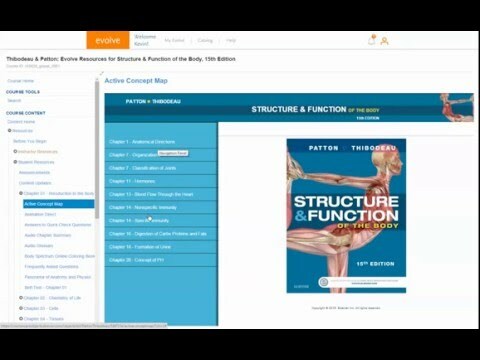 Starting with this edition of Structure & Function of the Body we are providing Active Concept Maps in the Student Resources in Evolve. Each Active Concept Map is an animated video of a concept map presented in a similar style to the concept maps used throughout the text of Structure & Function of the Body. However, these concept maps are "active" in the sense that they build from a single block as the narrator walks the viewer through each related concept that appears as the concept map branches and grows. The block-by-block guided walk-through of a major concept will help students understand what they have read and heard in class more deeply. It will also model for students how they can build their own concept maps for other sets of related ideas that they encounter in your course. Perhaps most importantly, the Active Concept Maps will provide a template for how to think in a "connected" way about the major concepts of the anatomy and physiology course. For challenged students, this is an especially important skill they must develop to succeed. What's Different in the New Edition? New Edition of Structure & Function of the Body Coming in November!